Hybrid technologies always give the benefit of both worlds. Various kinds of aircraft designs have their advantages and disadvantages. How about an aircraft that gives the benefit of a fixed wing aircraft and a helium airship, add to that the benefit of Zero carbon emission and Solar powered operation. 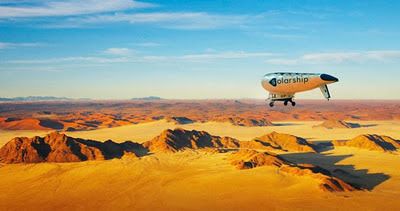 A Canadian Company called Solar Ship Inc. has come with such an interesting concept. The Solar Ship as its called is basically a hybrid airship. Just like any other airship it has an envelope to store helium which provides with Buoyancy/ lift to some extent, although the difference here is that unlike a normal Airship which completely relies for all its lift from the helium stored in something like a balloon on top, the solar ship on the other hand relies partly on the helium and partly on the aerodynamic lift created by the wings design. The airship is designed using Advanced aerodynamics, synthetic textile laminates that give the aircraft the ability to store helium and at the same time have enough stiffness to provide a perfect aerodynamic (aero-foil) profile to act as wings. Under normal conditions the solar airship would rely on the aerodynamic lift provided by the wing shape to give it more than half the lift required to get them off the ground. Additionally, the aircraft could also fly when filled with plain air. What this means is the aircraft will still be able to fly and land safely if there is any accidental damage that results in helium loss. On top of the wings it has an array of highly efficient solar cells providing it with the ability to store electric energy in batteries which can be used when required. The aircraft is designed by combining hybrid aerospace design with an advanced propulsion unit, Solar Ship is said to have the ability to carry a truck’s worth of payload, with greater flexibility than an airplane with the added benefit of unrivaled efficiency. The design also is easily scale-able and, with an increase in size the payload capacity is said to grow cubically. The Solar Ship would comes in 3 sizes (Small, medium, large). The smaller model is called the 'Caracal'. It is designed to get around in remote regions where roads are in rarity. Best suited to provide medical aid in remote locations. The Chui is a mid-size Solar Ship aircraft built for international space research and cargo markets. It features superior take off and landing capabilities; high efficiency; lowest infrastructure requirements; high endurance flight time capabilities and can be used as solar or hybrid-powered. Nanuq is a the largest of them all. Its basically designed to carry huge amounts of cargo and freights with high efficiency. Just a reminder, all these ships don't need fossil fuels to run so you the imagine the environmental benefits they carry. These models mentioned above are not yet in existence they are just concepts with can be actually built. Although Solar Ship has successfully built a prototype with actually works. The prototype works on an IC engine. All that said this is a fairly amazing concept and if investors invest money into the project it can bring about a big revolution in the aviation industry and could reduce a lot of carbon emissions around the world.